The Standard Letter Locker is a secure, locking mailbox for both residential and commercial use. With a superior design that outsmarts similar mailboxes, the Standard Letter Locker is our most popular box. 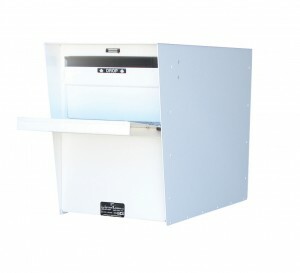 The Super Letter Locker is larger than the Standard model and includes a rotating hopper door (similar to Post Office drop-off boxes) with anti-fish “teeth”. These “teeth” help protect mail from being pulled up out of the box with wire or string. No other box on the market includes this feature! This model holds up to two weeks of mail. The Supreme Letter Locker is our largest box and will accept small packages and large envelopes. With the additional depth added for security, this model can hold approximately 4 weeks of mail, making it perfect for travelers. The Light Duty Letter Locker is similar in design to our standard with a few exceptions: it is constructed of a lighter gauge steel and does not come with an outgoing mail slot and notification flag. This box is best for those who drop off their outgoing mail at the Post Office. This models holds up to two weeks of mail. Wall Mount Letter Lockers are typically used by small businesses in an office setting and contain the same rotating hopper door as our Super model. The versatility of this mailbox allows customers to either mount them on a wall or use on a post. These models hold 1 to 2 days of mail. The Rural Letter Locker is the smallest in size, but packs a punch in strength. These models come standard in a heavy 12 gauge steel and are available in locking and non-locking models. These models hold 1 to 2 days of mail. Letter Locker Drop Boxes are made of 14 and 16 gauge electro-galvanized steel and are great for business such as utility companies or car rental facilities that accept items after hours. You have the option of a 1” or 2” incoming mail/item slot as well as having an envelope tray, or having it blocked off. Our posts are fabricated specifically for the Letter Locker mailboxes. High in strength and durability, we offer our posts in both aluminum and stainless steel and provide both Surface Mount Posts (for installations onto existing concrete) and In-Ground Posts (for installations directly into dirt or rock). Nearly our entire Letter Locker line is available in your choice of Steel, Heavy Duty Steel, Aluminum or Stainless Steel. Find which material best suits your needs for a perfect, custom box. We carry a vast array of accessories for our mailboxes that help you customize and personalize them just the way you wish. Nearly any Letter Locker product can be made in Aluminum. Aluminum is a strong, light-weight material that resists rusting and is a great cost alternative to Stainless Steel. Aluminum boxes are texture powder coated in Black, White, Grey, Tan or Mineral Bronze. Custom colors available. Letter Locker® products are available in a variety of different colors.